The SI (Showalter Index) is an index used to assess 850 mb parcel (in)stability. 2. How is SI determined? First note the temperature and dewpoint at the 850 mb level. Draw a line parallel to the dry adiabatic lapse rate starting from the 850 mb temperature. Draw a line parallel to the mixing ratio lines starting from the 850 mb dewpoint. The intersection of these two lines is the 850 mb LCL. From the 850 mb LCL, parallel the wet adiabatic lapse rate with height until the 500 mb pressure level is reached. Compare this 500 mb parcel temperature to the actual (environmental) 500 mb temperature. The sounding below shows an SI of 2.4. Thus, the parcel of air raised from the 850 mb level to the 500 mb level will be 2.4 degrees colder (negatively buoyant) as compared to the 500 mb actual (environmental) temperature. Dry air (high dewpoint depression) at 850 mb contributes to the stability. Instability: A negative SI indicates that the upper PBL is unstable with respect to the middle troposphere. This is an environment in which convection can occur. The more negative the SI the more unstable the troposphere and the more buoyant the acceleration will be for rising parcels of air from the upper PBL. Comparison to LI: If the LI is negative while the SI is positive (such as shown in sounding below), that is an indication that the PBL is unstable while the region just above the PBL is stable (some capping exists). If the LI is positive while the SI is negative, that is an indication that the PBL is stable but the lower troposphere becomes unstable with height. This can occur in cases where shallow polar air is in the PBL while there is an unstable air mass aloft. If the LI and SI are both negative it often indicates a deep layer of unstable air in the lower troposphere is in place. If the LI and SI are both positive it often indicates a deep layer of stable air in the lower troposphere is in place. Low level polar air: SI is great to use when their is a shallow layer of polar air in the PBL. In those cases, lifting will occur above the polar air-- thus SI will be much more relevant to use as compared to the LI. a. The SI only assesses instability in one level of the troposphere. Unlike SI, CAPE is better at assessing instability in the troposphere as a whole. b. 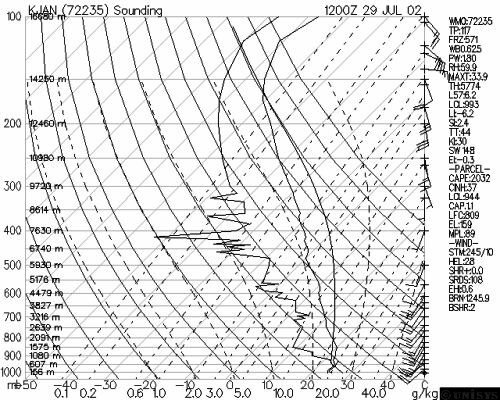 Take note of the elevation of the sounding station. If the 850 mb level is near the surface, then the LI and SI will basically be using the same method. c. Always look at the sounding to see what is causing the index to be stable or unstable. Sounding will show the depth of the air masses and how relevant using the SI is.